Your space marine is invaded by aliens. If you don't kill them, they will launch on earth and invade. 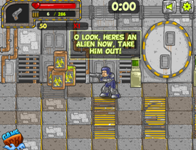 You should survive and attack them in this space war game.